No space scene is complete without an asteroid field. No sky is complete without clouds. Doing a land scene? You need rocks. This prop set gives you the best of all three with one prop. 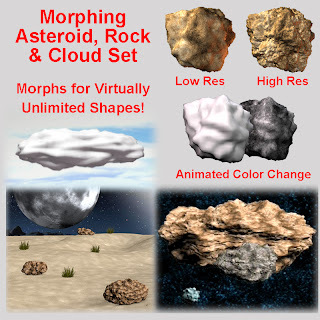 This set includes both high res and low res models with 11 morphs to uniquely shape the asteroid, rock or cloud to perfectly fit your scene. Not only are they excellent as stone or asteroid, but the clouds can even be animated to change shape as they move across your scene. Also, Includes 8 static props ideal for random rocks, debris around a main asteroid or small clouds. Includes materials for red, gray and blue stone, as well as, ice and clouds. The cloud prop has a material animation setting to dynamically change the color of the could from white to dark gray. Prefect for animating dark clouds on the horizon. Tested in Poser 7, 8, 9, PRO 2012 and DAZ Studio 4. NOTE: DAZ4 Shaders are supplied for basic DAZ 4 surface, but animation of surface shader is not supported.